For over a week we have been aware of a huge fire burning west of Ft. Collins, about two hours north of us. Fourteen square miles and almost 200 homes have been destroyed. Anyone living in the area has been evacuated, unable to check on their property or retrieve belongings. I’ve tossed up a few prayers, especially when I read news updates, but it hasn’t exactly dominated my thoughts. 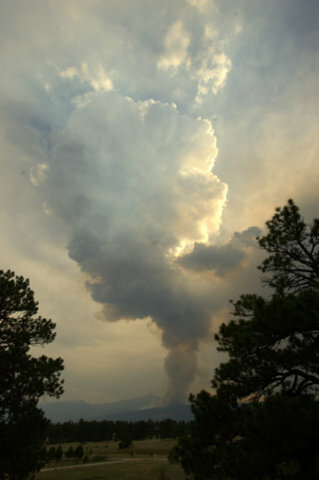 Saturday afternoon I happened to glance out the window and saw a huge plume of smoke rising from behind a ridge here in Colorado Springs. 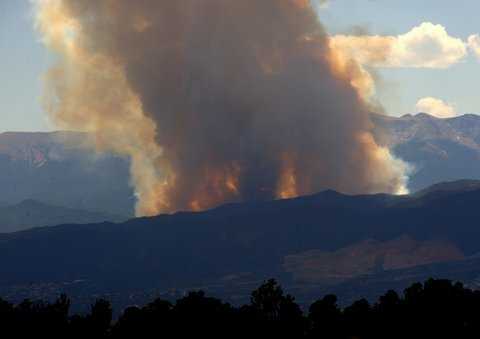 We were witnessing the first few hours of the Waldo Canyon fire. As I write this, thousands of people have been displaced although thankfully no one has been hurt and no structures have burned. Still, the fire has consumed 2,000 acres and is totally out of control. I can think of nothing else. Of course, living so close, with smoke burning our eyes and ashes falling around our house, it’s natural for us to be much more concerned about this fire. This isn’t some abstract disaster happening somewhere else. While we’re not in the path of the flames, we know lots of people who are. The world is a big place, and there’s always going to be a disaster going on. Turn on the TV, pick up a newspaper, check your internet news feed, and you can instantly learn about people somewhere in torment. We’ve become so jaded, we now only care about the big stuff—tsunamis wiping out whole coastlines, earthquakes leveling entire nations—and maybe the current justice issue. Jesus tells us to give to those who ask us for money, but how can we possibly give enough to provide relief on such a global scale? We’re told to feed the poor, help the widows and orphans, have compassion on those who are suffering—but how can we connect with billions of people who all need a hand up? The Apostle John asks, “If anyone has material possessions and sees a brother or sister in need but has no pity on them, how can the love of God be in that person?” (1 John 3:17) But the need is so overwhelming, we don’t know where to begin. As a result, we end up doing nothing. And that’s not okay either. I don’t have a solid answer on this, but I can share what Pete and I do. At least it helps us avoid “disaster paralysis.” Your solution may be different. If God prompts me to read further about a news story, I click on the link. Only if God seems to be assigning a particular issue to me, do I look for more stories on the topic. Then my response varies from prayer to financial support to more personal involvement, depending on what God has in mind. Second, we prefer to give to long-term solutions rather than relief efforts. It seems that well-publicized disasters get an outpouring of compassion and funds, which is as it should be. Supporting relief efforts is very gratifying, because you typically see immediate results. We’re willing to be patient, to see communities transformed as people are empowered to help themselves. Finally, we help those who God brings directly to us. In person. I’m reminded that Jesus told us to love our neighbor. How we help varies from housing church interns for a year or two, to sharing our resources with someone who needs them. Sometimes I buy lunch for a panhandler. The key is listening to the Holy Spirit, and staying available. I admit, this isn’t very easy. It’s scary to get personally involved in someone else’s problems. In the case of the fire burning a few miles away, we’re enjoying housing some friends displaced by the evacuations. I’m not sure what else we can do at this point, but I’ll be asking around to find out. I suspect our church will be very involved, and we’ll probably help with that. What do you do when confronted with a world of need? How do you keep your heart tender toward those who are suffering? How has someone else helped you? This entry was posted in Faith & God, Lessons Learned, Prayer, Stewardship, World and tagged fire, help, hurt, neighbor, overwhelm, suffer. Bookmark the permalink. Opening your home to others is a great comfort. When we lost power due to hurricanes, some friends in another community (with underground power lines maybe?) offered us their guest room, shower, and laundry facilities (to finish that one last load I tried to fit in before the storm was supposed to hit).